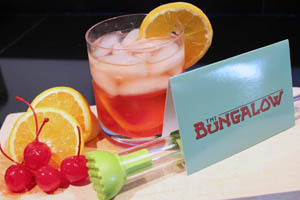 Old Fashioned The Bungalow Restaurant taste great. From dinner recipes, budget menus and healthy diet selections, you’ll easily find any recipe you need. Mix sugar, water and bitters in an old-fashioned glass. Drop in a cherry and an orange wedge. Muddle into a paste using a muddler. Pour in bourbon, fill with ice cubes, and stir. Garnish with a thin orange slice on glass rim.